A week full of intense discussions, new faces and of course catching with many friends, GUADEC is awesome as usual. This possibly is my 10 or 11th GUADEC. Highlights are the keynotes on GNOME Builder and Defending the GNOME Trade Mark. And of course loved the summer weather. I had a talk on Evolution for your Car, about the IVI prototype email solution, that I have been carrying on for the last couple of years. Part of couple of BOFs. Had a meeting with folks across India, about a possible summit in India (GNOME/Asia). Its a little late and many said do this before you forget, but IMHO such good memories don’t fade. 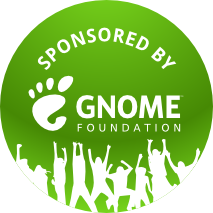 The GNOME board of directors meet the advisory board members of GNOME once in every month. They discuss a variety of topics related to GNOME. I had posted a mail on the foundation list about community suggested topics to be included on the agenda for the adboard meetings. When we have such topics, the board invites specific individuals to join the adboard call and let them present/speak about those topics to the board and the advisory board members of GNOME. We have our next advisory board meetings on the tuesday, April 13th 2010. If you have some specific topics that can be included/ you want to present to a wider audience, please reply to the thread or mail me (sragavan at gnome dot org). We are running out of time for the meeting for April, please do suggest us topics, if you have something specific/interesting to speak about. You can see some previous topics  and other topics  in the wiki. Screen1: Single window control center shell with Email setttings capplet in it. Thanks to Matthew for the debonofication & all other refactoring, I was able to pull out the editor/settings from Evolution as a stand alone capplet. Its part of anjal source and it uses some bits from anjal which helps to get everything up and running outside the Evolution shell. Without starting Evolution users will be able to open up the account settings, and first time open will get them a druid to setup basic account and other configurations like evolution. Since the evolution accounts stored in gconf, changes to the settings via this is instantaneous even if evolution or anjal is running in the background. Beyond all of these, it reuses 99% of evolution sources and with a little shell from anjal, it just works! In anjal, an user can open mails in new tab or composer in a new tab from draft. Generic tab implementation, appended tabs at the end and when closed the last but 1 from the closed tab is selected. The work flow for the user would be very difficult. To fix the problem, anjal considers the following while deciding which tab to chose or where to place. – When a tab is opened, it is placed next to a relavant tab. A email tab is placed next to the folder. Composer draft tab is placed next to draft folder tab. Rest of the tabs are appended to the end. – When a tab is opened, its remembered from where its opened. The lastly viewed folder, or any other tab will be the one which will be opened if this is closed. – On multiple visits, the last visit is only remembered. Should I consider any other case? IIRC Chrome has a similar scheme. 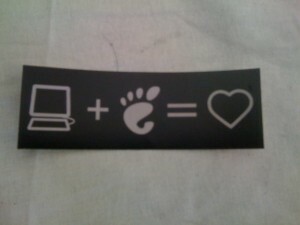 Srinidhi & I made some GNOME stickers for foss.in . 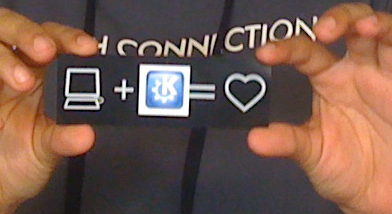 Didn’t realize when I first say huge sheets of KDE square stickers, why they are for ? Posted on December 5, 2009 Categories General10 Comments on Who forked it? foss.in is a very nice and premier event held annually in India and some of the GNOME contributors at India planned to organize a GNOME day at foss.in. Dec 5 2009, Saturday is the GNOME Project day and we have planned a bunch of sessions, workouts & talks. I just received few t-shirts for the project day for the GNOME volunteers and speakers. Some stickers is on the way I guess. Foss.in attendies, Meet us at the GNOME project day. All this wouldn’t be possible with out the GNOME Foundation board, who approved us a budget, even though the request was at the very last moment. I should also realy thank myntra.com for taking an order at the last moment, and still kept the word to deliver it over to me in less than 2 days. Good work, and I recommend them for a quality work and their time handling. Today is my last working day at Novell. Its my first company from campus and having spent 8.5 years at Novell, it is sad to part away. The last 6 years with Nat, Miguel, Michael, JP, Guy, Aaron, Fejj and many more was the best in my career and they all helped me a lot while working in Evolution/OOo/GNOME and thanks a lot for them :-). I’m joining Intel tomorrow to work in the Moblin team and do Anjal/Evolution. Happy that I would be still working with these people in some ways after moving to my new job. Over the last weekend, I was bored and previous friday I had a talk my with nice mentor Michael on calendars for the netbooks. All that triggered me to spend some time during the weekend on this new stuff. Basically I just hacked Evolution, to make it possible to write an external calendar application to fit well into a netbook space. Then I wrote some code to reuse that library and create this. Some screenshots below. It has a very minimal UI. I have a working *lite* calendar editor for creating/viewing meetings. I haven’t posted the code publicly yet. I would do that in the next week or so, once I get this to a better shape. Currently I can view, create meetings etc, work/week/month/day views. Support for evo’s plugins/exchange calendars needs to be fixed. The design approach is same as Anjal. Break Evolution’s calendar to reusable libraries. Don’t depend on any obsolete stuffs. No bonobo etc etc. Im planning to spend a night some time to commit of the patches that Evo needs before it is branched for 3.0. As of now, this is just 2500 lines of code. The UI is very new, and It might change, once UI guys do a review. But the idea would remain the same. This gets you Evolution’s calendar (CalDAV/Google, Exchange, Exchange MAPI(2007), webcal, etc etc) support, very much usable on a netbook. Defaulted to a size 750×500, it can fit well to any good netbook available today. I’m hoping to spend good time on this, very soon, to make it in production quality to the netbooks segment. Oh, btw, I haven’t named it yet. Suggestions ? Posted on August 5, 2009 Categories General27 Comments on Calendars for netbooks!! Moblin 2.0 is announced, and I can be more open now. Before I start with anything, one thing that I missed last time. The ‘new-ness’, ‘awesome-ness’ of Anjal’s UI, *FULL* credits of the UI design goes to the Intel UI Team, specially thanks Nick Richards, Hylke Bons, and Clarie Alexander. I really donno how many hours, its Nick who discussed each and every page of it in detail in chat, and helped me create the UI from mock. Btw, don’t ask and compare his wireframe with the UI , it deviates a bit, due to feasibility, etc. Now back to Anjal… screenshots…. descriptions. Here goes the main screen. Tabs – Every single thing is a tab. Your mail, folder, settings, account details, etc. Every thing is a unique tab. Meaning double click opened mail, you would be directed to the already opened tab. Are you a keyboard power user? If so, you can live inside singe tab. Keyboard controls (ENTER) opens the message in the same tab of the folder and BACKSPACE takes you back to the folder view. You don’t have to worry with mouse. Threads – I would call it smart threads, similar to gmailish. Threads group them selves, and moves up the sort, as and when you get new mails to it. The count says, how many messages you have in it. May be later, I would add how many new in it as well. The live-preview, gets you approx ~200 chars from the latest message of the thread. Its picks unquoted text, leaves out headers etc and gets you the possible best of the message. On the left, mark entire thread as read and on the right, mark all as junk/spam. People – Its not yet implemented. Ideally it would add a tab of addressbook. Thread Display – Everything inside a thread. This is the message view, with in the same tab. Other would look no different, when in a new tab. It just lists down the messages with in the thread. Auto scrolls down, to the first unread message, and auto expands it. Marks messages as read, as you scroll down the messages in the thread. ‘show details’ – hides most of the headers. Click that or Shift Left/right shows that. Oh, you need to reply? Click that ‘Reply to Andre Klapper’ button, opens you a inline composer, scrolled down well. Write up can and press Send. and continue reading rest of the thread. Next composing a new mail ? ‘To:’ – Auto completes from EDS. We just don’t have an addressbook UI. Need to search for an email ? Type and Enter to search. Instant apply message list. No regen etc. Thread in message list adpot to search automagically. Preview in message list too adpots to search. Fixed sorting options now, instant apply when selected. You will get a 1024×568 min welcome screen. It is intelligent than it appears. You just fill-in email-address. If its a popular service, it does the rest. ‘rupert@gmail.com’ then it fills in the IMAP/SMTP configuration automatically. Now just have GMAIL, Yahoo, MSN, AOL. In future, we would support more. I would like to do even region wise support. Check up everything on the review page. The setting page, now only provides an option to edit account. More preferences should be done down the lane. Its pretty usable now, though there are some random crashers and issue. Anjal has a bugzilla in GNOME and should be easy to try out and report a bug. Source code is maintained at http://git.gnome.org/cgit/anjal and Anjal need patched Evolution/EDS and Webkit. Patches available as part of the source code itself for various versions. GNOME 2.27.x would have the Evo/EDS patches merged in a week or so and I *must* soon push the webkit patches, been busy and didn’t have much time. Want to try out? Bharath is actively maintianing OpenSUSE build service daily snapshots – http://download.opensuse.org/repositories/GNOME://Evolution://snapshots/ Try out Anjal on OpenSUSE 11.1 / Factory. Or easier, find out how to try Moblin2 on OpenSUSE and see http://en.opensuse.org/Moblin for screenshots etc . We have a *scary* (It will wipe off your disk and Install OpenSUSE/Moblin) iso as well as installable rpms. Ok, all those apart, its still not yet 0.1, which is gonna be very soon. It works well, reliable, but there some crashes, minor issue, ui glitches yet to be carved to perfection which is on the way very soon. On the whole, checkout everything, join us. Moblin rocks!!! Anjal is a new mail UI created on top of Evolution. It would have a very interesting UI & features, that would make it the very suitable for low memory/processor/resolution devices. It is Evolution & EDS at the back of Anjal. We have broken down Evolution mail library to a smaller component and made a reusable shared library to be used by Evolution. Anjal would be using WebKit for mail rendering and composing. It features a nice multi-line message list, with unquoted text-preview of the latest messages in the thread. Its configurable to make it even more lighter, by choosing a sqlite-cursor-based tree view, which would have the visible window of the message list on memory, very suitable for mobile environments. It supports tabbed browsing, a small preference window & new account setup. The project is ~20 days old and would go more changes as it grows, wrt features and UI, to make it a good mail-client for GNOME on Netbooks. It would feature a nice conversation view, where you can open/view threads on the conversation view. Yeah, you would ideally see your messages also part of the thread. I have some more screenshots at here. The code is hosted in git://git.gnome.org/anjal You can check out, try use it and ofcourse contribute to it. You probably have to patch EDS, Evolution and Webkit which adds some new apis. The patches are part of the source repository. We don’t have a bugzilla yet, but we are working hard for a 0.1 pretty soon. Pour your feedback to me. It was Saturday morning 2:00 am when I published the tarball. So what’s special? Thx to “ever great” Milan Crha for hacking out sqlite/fsync/ext issue which hurt our performance a lot. He wrote an awesome piece of sqlite vfs similar to FF’s vfs but a lot simpler which improved performance by 75% atleast. And thanks to David Ronis (huey) for some fine bugs which saved 2.24.4 and thx to Srinidhi who gave me the ultimate NEWS generation script which just did everything automatically. It’s a bit buggy but should be better in sometime. I would push Srinidhi to share it somewhere , it would be useful for a lot of people.